Picked up by our company representative (Tour Guide) from Entebbe International Airport), transfer you to your place of residence in Entebbe or Kampala. You will be welcomed with a cold juice from fresh fruits, check into your rooms, have some massage or sauna, dinner and overnight. 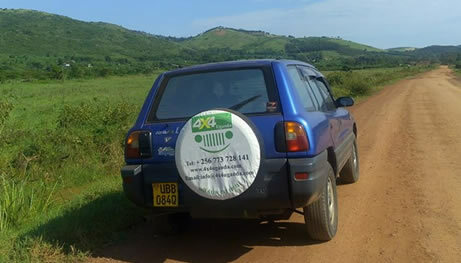 You will be picked up from the hotel by our tour guide and transfer by road in a 4×4 safari jeep through Uganda’s rolling green hills to Lake Mburo National Park. This is a geographical extension of the Tanzanian plains and is home to a vast population of zebra, is the only park in Uganda with an impala population, and is the best place to spot the African finfoot. On the way we will stop at Katereke, one of the Kabakas’ Trail Heritage Sites. Upon arrival in the park, spend the afternoon recovering from jet-lag or paddle on the lake in a dug out canoe listening to the wallowing hippos. There are opportunities for an evening game drive. You stay overnight at the privately tented Mantana Camp / Arcadia cottages / Rwonyo tents / Lake Mburo safari lodge or Mburo Eagles Nest Lodge (Full Board). After breakfast you will continue on your journey south towards the highlands of Uganda, also known as the Switzerland of Africa, which yields fantastic views of the Virunga Volcanoes of Rwanda and the Congo. You will stop off for lunch in one of the towns you pass through before making your final descent into the valley, to Bwindi Impenetrable Forest National Park which is home to the endangered Mountain Gorillas. You stay overnight in Gorilla Forest Camp / Mahogany Springs Lodge / Gorilla Mist Camp or Buhoma community Rest camp (Full Board). An early start with a heavy breakfast will have you prepared for one of the most unique wildlife experiences in the world, gorilla tracking in Bwindi Impenetrable National Park. You will meet your guides at the ranger station at 8.00am who will then lead you deep into the impenetrable forest. It can take anything from two to eight hours to locate the gorillas and therefore requires a reasonable degree of fitness as well as good hiking shoes / boots. Once you find them in this mysterious world, you will sit listening to them grumble at each other and cannot help but marvel at the sheer size of the dominant male, the silver back. Sight and stay with these Gentle Giants is one hour maximum. Later descend to your lodge for entertainment from local community dancers, dinner and overnight. Time permitting, we can take an evening community walk or forest walk. After breakfast you will leave the park heading north towards Queen Elizabeth National Park passing through Ishasha en-route, famed for its tree climbing lions. Check into your lodge and embark on evening game drive. If interested, we can take a night game drive to look for night dwellers. Overnight at Mweya safari lodge / Enganzi Lodge / Kyambura Game Lodge or Bush Lodge among others. This morning you will leave for a chimp trekking in Kyambura Gorge. These adorable apes, more closely related to humans than to any living creature, are incredibly fun to watch as they play in fruiting trees. After spending time with the chimps you will return to the lodge for lunch. In the afternoon you have the opportunity to view wildlife in close proximity on a boat trip along the Kazinga Channel Hippo’s wade and spray a few feet away from the boat, while buffalo linger in the shallow water. This area is home to about 600 species of birds for the birding enthusiast. After this spectacular afternoon, take a slow drive back to Lodge in sun set for dinner and overnight. Start the day early on a morning sunrise game drive before returning to enjoy a delcious breakfast at the Lodge. Animals you may see include elephant, water hog, lion, hyena, waterbuck and bushbuck among others. Depart Queen Elizabeth National Park for Ndali Lodge near the town of Fort Portal. The lodge is perched atop a hill with the most stunning views down to a private lake on the one side and waving green banana plantations on the other. In the afternoon you will have a chance to relax and tour a tea plantation where you will be able to see the process from start to finish as well as sample the fresh tea and if impressed, buy some for yourselves. Alternative, we take a community walk in Fort Portal, visit and interact with local people in markets and fields, overnight at Ndali Lodge or Chimpanzee Guest House or Kibale Safari Lodge / Kibale Forest Camp (Full Board). Wake up early to track the amazing habituated chimps. The forest is home to over 13 species of primates including the rare L’Hoest, Red-tailed monkeys, blue monkey, pottos, black faced vervet monkeys, grey mangabey, bushbabies and Olive baboons among others. Birders are in for a treat with 335 recorded species. The elusive forest elephant moves seasonally into the more developed part of the park Return to the Lodge and spend the afternoon relaxing at the estate. In the afternoon, we transfer to Semliki Wildlife Reserve, dinner and overnight at Semliki Safari Lodge or UWA Bandas (Full Board). Accompanied by park guide and armed rangers, start the trek in search for Chimpanzees. They are more active than gorillas and tend to be seen at dawn and dusk. If lucky, you will catch the chimps in their night nests and observe them come to life. Return to the lodge for brunch and a chance to lounge by the pool. Before sunset, go out in the open topped vehicle for sundowners and watch the sun drop over the blue tinged Mountains of the Moon. If interested, we take another night-game drive in Semlik Wildlife Reserve. Breakfast and hit the road to Murchison Falls N.P. 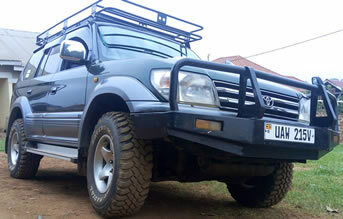 Its about 8 hours drive through Ugandan rural areas and small trading centers as well as Lake Albert view. Murchison Falls National Park is known for the best wildgame viewing. Before checking in at the Paraa Safari Lodge, you will stop at the top of the falls which is a stunning sight. See the Nile, the longest river in the world plunging into a waterfall. You stay overnight at Murchison River Lodge or Paraa Safari Lodge which is a luxurious lodge with stunning views over the Nile. Other places to stay include Red Chilli Rest Camp, Pakuba Safari Lodge or Baker’s lodge among others. After breakfast you will go for a morning game drive across Borassus Forest and Savannah, returning to the lodge for lunch before heading out in the afternoon. Here you will embark on a boat cruise and head off to the bottom of Murchison Falls. En-route you will come across large pods of hippo with crocodiles looming in the reeds. Elephants, Giraffe, Buffalo as well as countless water birds are also regularly seen. The falls are not renowned so much for their height, but for the sheer force of the Nile, the longest river in the world, being squeezed through a seven meter gap in the rift escarpment before thundering down 43 meters into a deep pool. The result is a mass of white water and an extremely dramatic sight. Return to the lodge with the option of going on a evening game drive or having sundowners on the verandah. After breakfast, you will be transferred to Pakuba Airstrip for your private charter plane flight to Kidepo National Park, which is Uganda’s second biggest National Park. Apoka Lodge is the only lodge in the entire area. Kidepo is one of Africa’s last great wilderness areas. Perennial running water in the Narus River makes Kidepo an amazing oasis in the semi desert. Apoka Lodge has astounding views of the plains and the jagged mountains in the distance. A special feature is the outdoor bathtubs, which are carved out of the rock face. While the game viewing is fantastic, it is exclusivity of the lodge which is the main attraction. This last day will give you a chance to relax as well as explore parts of Kampala. You will be taken on an ‘urban safari’to the bustling fruit and craft markets and on to some of the best cafes, galleries and boutiques in town. Tasteful souvenirs can be found here. You will transfer to Entebbe International Airport for your outbound flight.